Italy, with the Islands of Sicily, Sardinia, & Corsica, Drawn from the Best Authorities. 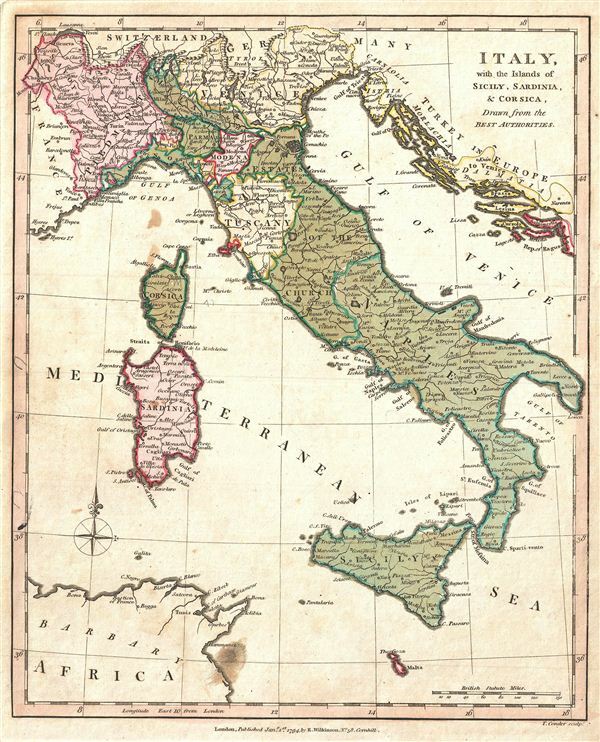 An exquisitely detailed first edition 1794 map of Italy by Robert Wilkinson. Covers the entire peninsula of Italy as well as Piedmont, the Venetian States, the Dalmatian Coast, and the islands of Sardinia, Corsica, and Sicily. Color coding defines individual regions. Italy at this time was a diverse assortment of fiefdoms, religious statelets, and republics in the process of sloughing of rigid control of powerful renaissance dynasties. This process would culminate in the French invasion of northern Italy and the creation of the Kingdom of Italy in 1796, just two years after Wilkinson drew this map. Though Napoleonic control of Italy lasted only until 1814, the brief period of unity inspired the Italian solidarity movement to follow. engraved by Thomas Condar for the 1794 first edition of Robert Wilkinson's General Atlas. Very good. Minor marginal soiling. Discoloration bottom center. Original platemark visible. Blank on verso.